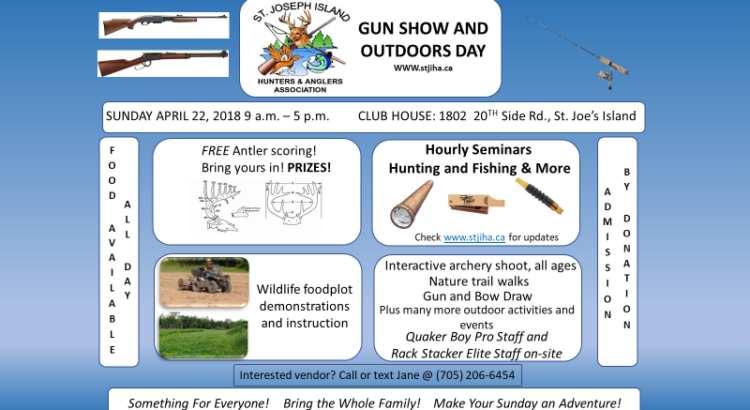 The Gun Show and Outdoor Day is nearly here! Throughout the day, there will be many vendors who will be selling or trading guns, knives and fishing and hunting accessories. There will be outdoor exhibitors with ATV’s, jet skis, docks, boats, motors, etc. Hourly seminars will explain and demonstrate the development of wildlife food plots, wild turkey calling and numerous other topics (see below for schedule). There will be an interactive outdoor archery range. The day also includes official antler scoring, so be sure to bring your deer or moose antlers. A raffle will give you a chance to win a gun or bow. The on-site nature trails are open for exploration, and food and drinks will be available all day. This is a family-oriented event. Admission is by donation.